LG Electronics USA Business Solutions announced on the first day of the Digital Signage Expo in Las Vegas, digital signage displays based on OLED technology. The paper-thin, dual-sided displays will be available in curved and flat configurations. 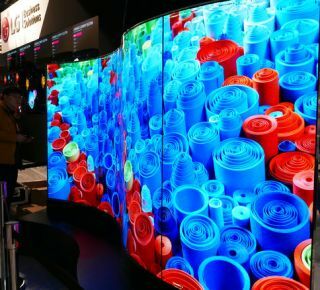 LG’s commercial OLEDs feature "the picture quality that customers recognize from LG’s consumer OLED televisions," according to LG, now available to businesses seeking display solutions. OLED is a new category of display that delivers picture even from wide viewing angles. With OLED, each of the screen’s 8 million pixels can be turned on and turned off. That means blacks rendered by LG's OLED displays are up to 200 times deeper than those of an LCD panel, creating an infinite contrast ratio and bringing colors to life. The Dual-View Curved Tiling OLED display offers a curved design using slim tiles to form customizable displays that link two, three or four tiles together. The 65-inch portrait display, boasts a paper-thin and an eye-catching dual-sided view to offer customers a multi-media experience while providing retailers a way to utilize their space efficiently. Each screen boasts 4K Ultra HD (3840 x 2160) resolution, showcasing a more lifelike viewing experience to capture consumer attention. High-performance system-on-a-chip (SoC) and an internal memory capacity enable UHD-synced playback without the need for PCs or media players. The Dual-View Curved Tiling OLED display can fit into any retail or commercial space.